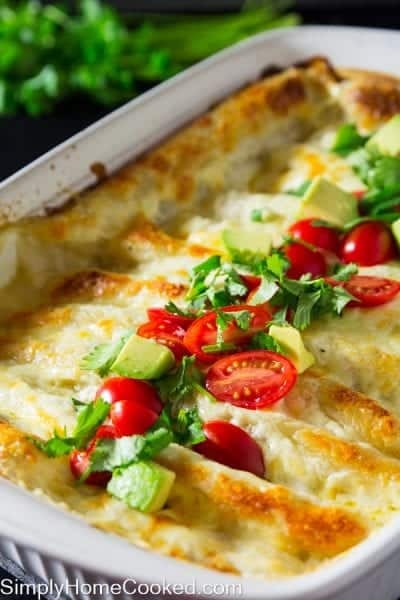 This chicken enchiladas with white sauce recipe is so saucy and flavorful. You won’t believe how simple and delicious it is. These enchiladas are loaded with chicken, corn, green chilies, cilantro, and lots of cheese. And of course, they are covered with a simple yet delicious homemade sauce. Today’s recipe marks recipe number 200 on my blog! woohoo! I can’t believe how quickly the recipes added up in only 2 years. 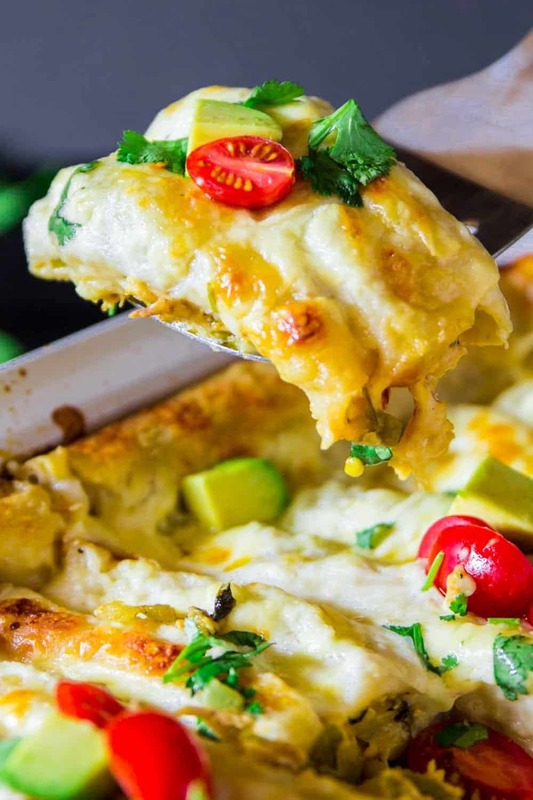 We are celebrating the 200th recipe with these cheesy, gooey, melt in your mouth white sauce enchiladas. This recipe was originally posted on Feb 15, 2017, we’ve tweaked it a bit since then. First off you want to make the sauce by combining melted butter, flour, and garlic in a saucepan. Then pour in chicken broth, sour cream, salt, and pepper. Next, sautee onion and garlic in a saucepan with melted butter. Then add the shredded rotisserie chicken, corn, green chilies, cilantro, cumin, chili powder, salt, pepper, and Monterey jack cheese. Then pour in 3/4 cup of the white sauce into the chicken mixture. scoop 1/4 cup of the chicken mixture into each flour tortilla and roll them up. Place them in a deep baking dish and add the rest of the white sauce along with extra Monterey jack cheese. Bake for 40-45 minutes at 370 degrees Fahrenheit. If you love MEXICAN food be sure to also try these DELICIOUS Mexican recipes. Red Sauce Enchiladas– made with an authentic red sauce, and rolled in corn tortillas. Chicken quesadillas– with hatch chilies, corn, and rotisserie chicken. Grilled steak tacos– The ultimate “street food” taco. Tools used to make this chicken enchiladas recipe. Yes! If you want to freeze these enchiladas with white sauce, go ahead and make them up until ready to bake, but don’t bake them. Fill the baking dish with the enchiladas along with the white sauce on top and wrap the entire baking dish with plastic wrap then with foil as well. Then place them in the freezer. How long can I freeze enchiladas for? Homemade enchiladas can be stored in the freezer for up to 3 months and up to 24 hours in the refrigerator. How long to bake frozen enchiladas? Preheat your oven to 350 degrees Fahrenheit. Remove the plastic wrap and place the foil back on, then bake the frozen enchiladas for 45 minutes or until warmed through. Pro tip: This chicken enchilada recipe serves about 12 enchiladas. If you’re a small family, this might be too much for one dinner. Worry not, divide the recipe between 2 smaller baking dishes and freeze one for later. They taste just as amazing after being frozen. 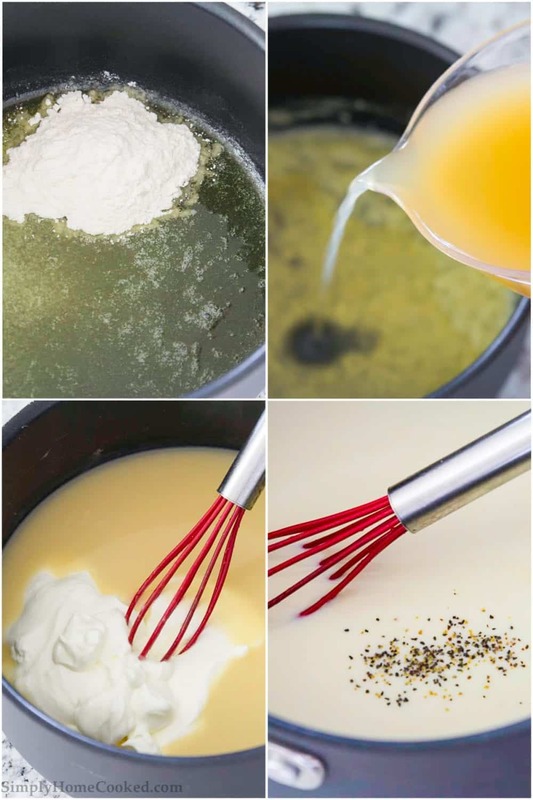 See above for instructions on how to freeze cheese enchiladas with white sauce. 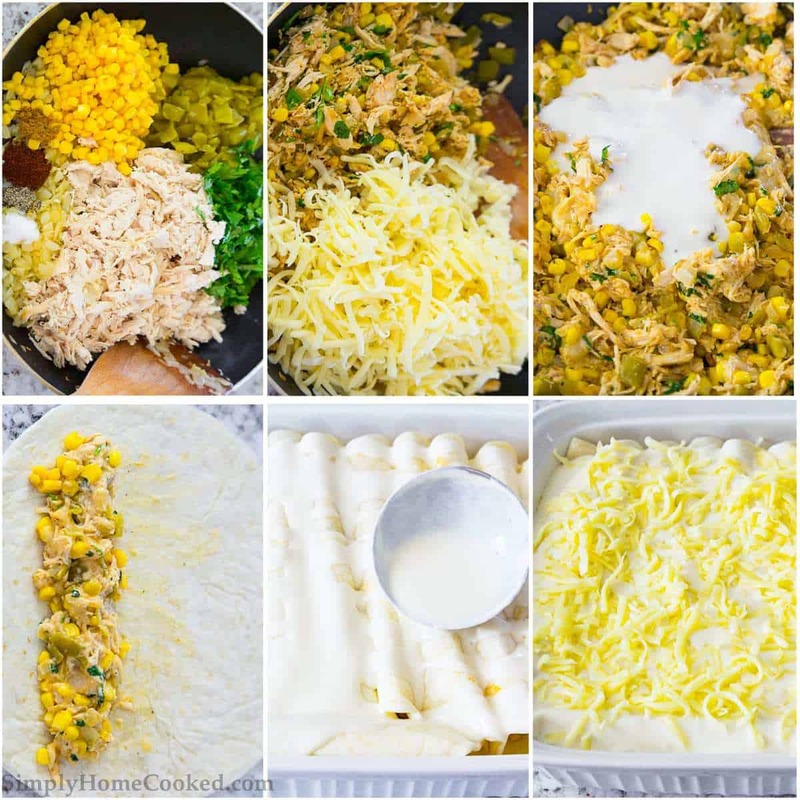 Cheesy, saucy, white sauce enchiladas that will become a family favorite. Melt 3 tbsp butter in a skillet. Over medium heat, sauté the chopped onion and minced garlic for about 5 minutes. To the skillet, add shredded chicken, corn, diced green chilies, cilantro, cumin, chili powder, salt, and pepper. Mix to combine. Add 1 1/2 cup shredded Monterey Jack and mix once more. In a sauce pan, melt 3 tbsp butter and thoroughly mix in 3 tbsp flour. Stir for about 1 minute over medium heat. Then quickly stir in 1 grated garlic clove. Slowly pour in the chicken stock as you stir it into the butter and flour mixture. Then bring it to a simmer for 4-5 minutes or until it begins to thicken slightly. Add the sour cream to the sauce and continue to stir until the sour cream is well incorporated. Then stir in the salt and black pepper. Spread a thin layer of the white sauce onto the bottom of a 9 x 13 inch baking dish. Pour 3/4 cup of the sauce into the chicken filling mixture. Mix well. Scoop about 1/4 cup of the chicken filling into each flour tortilla. Roll them up and place them tightly next to eat other into the baking dish. Pour the remaining white sauce over the rolled up enchiladas, and top with the remaining 1/2 cup Monterey Jack cheese. Cover with foil and bake at 370 degrees Fahrenheit on the middle rack for 40-45 minutes or until bubbly. Then remove the foil and bake until the top is golden brown. These were delicious. Thank you for the great recipe. Thank you Valentina, glad you enjoyed them! The texture of the flour tortillas is off. The white sauce is very bland. The filling has good flavor and texture although I used shredded beef that I made. I may use the filling recipe again and substitute corn tortillas. I wanted to rate this 2 stars but when you click on the stars, it automatically selects 5 stars, so I’ll leave it blank. I appreciate the time you took in photographing and documenting this recipe. It just wasn’t to our liking. Thanks for the inspiration, I made enchiladas for dinner yesterday. I used pork but used the white sauce similar to yours. They were yummy!! And congrats on your 200th recipe! Wow!!! Dina congratulations! That’s a lot of recipes in two years. Good job ???????? love your site. No problem Loretta! Hope you enjoy them as much as I did!